Canine Spinal Chord Injuries – Is Chondroitinase The New Magic Treatment? Spinal chord injuries in pet dogs can be devastating for the dog and their owners: lifelong loss of nerval function caudal of the location of the injury, regular vet control examinations and physical treatments, having to cope with uncontrollable bladder- and bowel functions and most likely difficulties to exercise the dog appropriately. An interview with veterinarian Dr. Hilary Hu at Iowa State Veterinary Hospital describes interesting results. What treatments are available for spinal cord injury? Dr. Hu: Numerous treatment modalities have been developed over the years in laboratories throughout the world and they can be broadly categorized as Biological (e.g.stem cell therapy) Pharmacological (e.g. anti-inflammatories) Physical (e.g. physical therapy andacupuncture) treatment modalities However, none has really been shown clinically to reliably and significantly improve spinal cord function after severe injury. The regain of function post-injury is currently limited because the spinal cord has a very poor regenerative capacity. The potential treatment we are testing is called ‘chondroitinase’, which has been shown to be beneficial to functional recovery after spinal cord injury in laboratory rats and mice. For this trial we have selected dogs that are unlikely to recover on their own with conventional therapy. These are mainly dogs that have not recovered their ability to walk without assistance by about three months after the original incident. 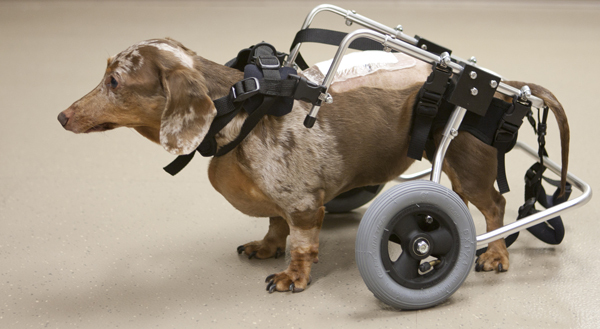 Human patients might also benefit from our clinical trial because if our paralyzed trial dogs were shown to benefit from this potential treatment, then the next step would be to test it on human patients with spinal cord injury. The way that this potential treatment works is by dissolving away some of the scarring tissue that forms after spinal cord injury, allowing new nerve fibers to grow across the damaged region and restore communication [..and..] by breaking down the scar tissue at the site of the lesion that prevents nerve regeneration. So in theory, this potential treatment should have similar effects on older as well as more recent (approx. three months) injuries. The U.S. Department of Defense has been funding research on canine patients at the University of California, San Francisco and Texas A&M College of Veterinary Medicine and Biomedical Sciences after scientists had gotten promising results in lab mice. The injectable drug won´t repair damaged nerve tissue, but lessens damage that occurs secondarily to the injured spinal chord caused by inflammation thorugh certain proteins. Now the Texas team will test how it works in previously injured short-legged, long torso breeds of dog like dachshunds, beagles and corgis, who often suffer injuries when a disk in their back spontaneously ruptures, damaging the underlying spinal cord. Now, researchers will test whether the new treatment works on some of these dogs, with their owners consent. We are in a unique position of being able to treat a dog population where there are simply no current therapies that could effectively improve their hind limb function. The new treatment does not seek to regrow injured pathways in the spinal cord. A few years ago, Noble and her UCSF colleague Zena Werb, PhD, showed how blocking the action of one protein found in the spinal cord of mammals can help mice recover from spinal cord injuries. This protein, called matrix metalloproteinase-9, can degrade pathways within the cord and cause local inflammation, leading to cell death. This interesting research programme will certainly help so many canine patients. The best over all is however that it looks as it can be used in human medicine as well. Hopefully it will be made available to everyone. Previous Previous post: How Do I Know If Acupuncture Works For My Cat Or Dog?